Following the tragic collapse of the Polcevera bridge on 14 August this year, incorrect information about Autostrade per l'Italia's activities and operations has often appeared in the media and in public debate. Autostrade per l'Italia wishes to provide the public with a number of facts regarding the Morandi Bridge and Autostrade per l'Italia's Concession Agreement in general, whilst bearing in mind that it is not yet possible to define the technical causes of the collapse. Much of the information provided below has already been included in earlier public announcements made by Autostrade per l'Italia. However, we believe it is constructive to collect it to provide a single source of information. All the technical information was supplied by the managers who are legally responsible for the technical aspects of operations (the Contracting Entity - Committente, the Project Manager - Responsabile Unico del Procedimento (RUP), the Works Supervisor – Direttore Lavori, the Designer - Progettista, and the Safety Manager – Responsabile Sicurezza). 1. "Autostrade's privatisation was a gift for the Benettons." Phase 1 (June-October 1999): a tender process to sell 30% of the issued capital to a group of core shareholders willing to pay a control premium over and above the price of the shares offered for sale in the subsequent Initial Public Offering (IPO). Following the withdrawal of the only competing bidder – the Australian fund, Macquarie, which had submitted a non-binding offer – the one remaining bidder was Schemaventotto, a consortium made up of Edizione (controlled by the Benetton family), Acesa (now Abertis), Fondazione CRT, UniCredit and Assicurazioni Generali, which offered to pay a 5% premium over the IPO price. Phase 2 (December 1999): floatation of the remaining shares (57%) held by the State through an IPO. Phase 2 concluded with the sale of the shares at a price of €6.75 per share, essentially purchased by small investors (around 40% of the issued capital) and, to a lesser extent, by institutional investors (half of them Italian). The sale of shares on the international market proved difficult as there was a perception among international institutional investors that the price was too high when set against interest rates that were at that time much higher than now. It was therefore the market (with great difficulty) that set the price of the privatisation. The price paid by Schemaventotto to acquire a 30% stake in Autostrade was €7.0875 per share, equal to the IPO price plus the 5% premium offered by the consortium in phase 1. Schemaventotto's total investment was €2.52 billion. The total amount raised from the sale of 100% of the Company (at an average price of €6.87 per share) resulted in a market capitalisation of approximately €8.1 billion, 4.5 times its equity value. At this IPO price, the ROE (return on equity) implicit in the price paid to the State as the seller was 3.7%, well below market levels. In other words, the price already discounted the potential for and need to significantly improve the Company's efficiency, compared with the projections in the Financial Plan annexed to the Concession Agreement of 1997 on which the IPO was based. Autostrade's privatisation earned the highest premium over book value of all the main privatisations carried out by the Italian State at that time (Enel, Eni and Telecom Italia). Following the privatisation, the share price remained stable for almost two years (in November 2001, the share price was still around €7), reflecting the market's continued perception that the new owners had overpaid. A final consideration: whilst there were several members of the original consortium, for various reasons, Generali, Unicredit and Abertis later withdrew, leaving only CRT as a shareholder alongside the Benettons. 2. "The Concession Agreement guarantees Autostrade per l'Italia a return of 10.21%, which is too high and out of step with the market." FACTS: Autostrade per l'Italia's Concession Agreement, unlike those for other public services, does not provide for automatic adjustments in order to guarantee a certain rate of return for the Company. In fact, at the time of the privatisation in 1999, the State invited tenders for a Concession applying a price cap formula to tolls. Autostrade per l'Italia's regulatory framework does not, as in other sectors, envisage 5-yearly reviews designed to guarantee a return on capital (or RAB), an option offered to motorway operators by the Interministerial Economic Planning Committee Directive of 2007, but which Autostrade per l'Italia has not taken up. The Company decided to continue to be subject to the existing pure price cap regulation, in keeping with the system in place at the time of privatisation. The option of unilaterally modifying the system was excluded by the EU as part of infringement proceedings against Italy in 2007. This price cap system is, moreover, applied to motorway operators in almost all countries around the world (including France and Spain). Therefore, unlike other regulated companies, traffic or interest rate risks (among many others) are substantially borne by the operator, just as Autostrade per l'Italia is exposed to the risk of cost overruns in completing the investment programme included in the 1997 Agreement (as was the case, for example, with the Variante di Valico project, which cost over €3.5 billion more than envisaged in the 1997 Agreement). The nominal pre-tax rate of return of 10.21%, often referred to in the Company's Financial Plan for 2013-2017, only relates to the return on certain additional investments introduced in 2008. Only these investments qualify for a five-yearly review and, in application of Interministerial Economic Planning Committee Directive referred to above, adjustment of the rate of return on investment every five years. These investments currently amount to approximately €200 million – compared with the total of €13.6 billion invested since the privatisation – and have a totally marginal impact on tolls (0.05% per year). The above pre-tax rate of 10.21% was set when the crisis over spreads was at its height (2012) and is equivalent to an after tax rate of return (6.85%) only slightly above the after-tax yield on Italian government bonds (BTPs) of approximately 5% at that time. In the new five-year period of 2018-2022 this pre-tax rate will fall to 7.61% (5.40% after tax), primarily following a reduction in the reference rates. In any event, it is useful to compare this with other sectors. A recent study by Brattle, a leading consulting firm specialising in the sector, based on official data published by each regulator, compares the most recently set allowed returns in various regulated industries, after adjusting for inflation. The study shows reveals the following nominal pre-tax WACCs: Italgas (7.7%), Snam (7%), Terna (6.9%), Stogit (8.1%), Enel Distribuzione (7.2%), Telecom (8.77%), Autostrade per l'Italia (7.61%). Based on this objective data, it is clear that the return on Autostrade's additional investments is in line with that in other sectors. In fact, all of them are calculated using the same method, the Weighted Average Cost of Capital, adopted by various regulators or established, in the case of motorways, by the Interministerial Economic Planning Committee. Finally, it should be noted that, in April 2018, the EU Commission - in part using market benchmarks – conducted a review of Autostrade per l'Italia's entire concession regime (including tolls and returns on investment), judging it to be fair and in line with European legislation governing services of general economic interest (SGEI). In conclusion, Autostrade per l'Italia does not benefit from a guaranteed return on its investment. 3. "Genoa: Autostrade per l'Italia obtained concession without a tender process"
FACTS: In relation to statements made by the secretary general of the Italian Competition Authority, claiming that there was no tender to award the concession the company specifies that during privatisation the company was contracted as part of an international tender. This tender concerned the concessionaire company, not the concession – at that time concessionaire and concession being two coincident matters. The Company also recalls that the Antitrust Authority has no jurisdiction over bids and tenders. "Autostrade obtained an extension of its concession term without a tender process, a further gift to its private shareholders." FACTS: In April 2018, the European Commission and the Italian government reached an agreement giving the go-ahead for a large-scale investment programme, essential in order to make improvements to the Italian motorway network, keeping toll increases to a minimum whilst limiting distortions of competition (European Commission Press Release of 27 April 2018 ). Europe had already authorised similar initiatives in the past, including a similar plan to improve the French motorway network in 2015 (Plan de relance autoroutier), for which the Commission allowed French operators to earn far higher rates of return. The so-called "extension" of Autostrade per l'Italia's concession term, for a further four years from 2038 to 2042, would enable the Company to spread the return on new investment (€7.9 billion by 2030, including €4.3 billion for the Genoa Bypass) over a longer period, thereby reducing toll increases. Having received a green light from the European Commission, the Minister of Infrastructure and Transport now has to decide whether or not to continue with the process. As things stand, the natural expiry date for the concession thus remains 2038. To sum up, the extension of the concession term from 2038 to 2042, which is subject to approval by the Ministry of Infrastructure and Transport in consultation with the Ministry of the Economy and Finance, would enable toll increases to be kept to a minimum despite investment of approximately €7.9 billion. 1. "Autostrade's tolls are the highest in Italy and Europe." FACTS: The tolls charged by Autostrade per l'Italia are lower than the average for Italian and European motorway concessions (in countries with toll motorways). For instance, tolls on Autostrade per l'Italia's network are, on average, around 40% lower than those applied in Spain and around 15% lower than those charged in France. It is important to note that the final amount charged to road users also reflects levels of taxation (VAT, concession fees, etc. ), which are different in the various European countries, and that tolls do not simply depend on the number of kilometres travelled, but also on the geographical nature of the area crossed by the motorway (tolls for motorways on low ground are lower than those for motorways on high ground). A comparison of certain routes included in Autostrade per l'Italia's network with French motorway routes (as shown at www.autostrade.it and www.autoroutes.fr) clearly shows that tolls on Autostrade per l'Italia's network are far lower, despite the fact that France has a less complex geography than Italy and for this reason construction and operating costs are lower. This is not a like-for-like basis comparison, as the chosen route in France (Paris-Lyon) is a rather "particular" section of French motorway, with "only" 378 km of toll motorway operated by a single company (APRR), out of a total of 452 km, and 73 km of non-toll motorway (the sections between Paris and the Fleury-en-Bière toll station, owned by the State, and between Ville Franche-Limas and Lyon). In addition, the Paris-Lyon section is almost entirely on level ground. The Ventimiglia-Bologna route is more complex, as it is operated by five motorway operators (including Autostrade per l'Italia that operates 239 km out of the 442 km in total) applying different tolls, and also because around 50% of the route is on mountainous ground, with a higher charge per km. 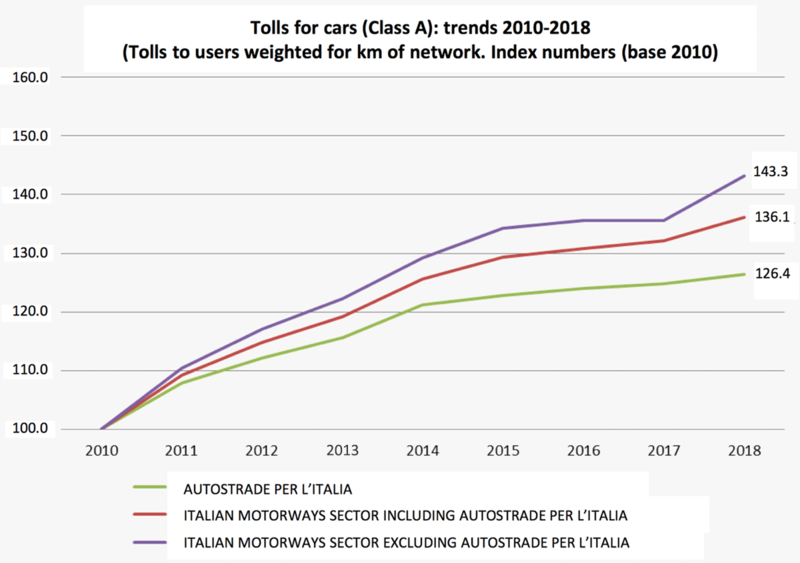 Moreover, in terms of the Italian motorway sector, as shown in the following charts1 referring to the period 2010-2018, the increase in the toll charged to the users of Autostrade per l'Italia's network (+26.4%) is far lower than the average increase applied by other Italian motorway operators (+43.3%). In addition, the increase in the toll-related component alone attributable2 to Autostrade per l'Italia (+19.5%), in the same period, was approximately half the average increase at other Italian motorway operators (+37.7%). 1) In terms of the Italian motorway sector, the charts show average amounts (excluding orbital motorways and tunnels subject to tolls) for tolls (€/km) charged for private vehicles (Toll Class A), calculated by weighting the various tolls charged by the different operators to reflect the number of kilometres of motorway operated (low and high ground). Sources: The network lengths on the basis of which the average tolls were weighted were taken from six-monthly data published by AISCAT. The motorway tolls charged by Italian operators are those determined by the interministerial decrees approving toll increases. 2) The toll-related component attributable to the operator is calculated before the application of VAT – which from 1 October 2013 is charged at a rate of 22% - and the surcharge passed on to ANAS - which from 1 January 2011 amounts to 6 thousands of a euro per km for toll classes A and B and 18 thousands of a euro per km for classes 3, 4 and 5, applied on all toll roads, excluding tunnels. 2. 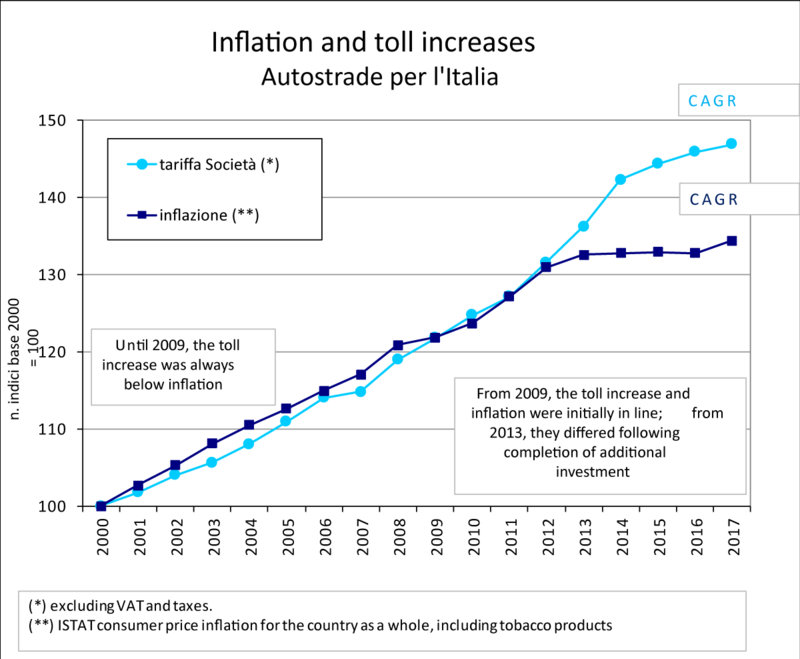 "Autostrade per l'Italia's toll revenue growth has outpaced inflation without any justification for this." FACTS: The following chart shows the performance of tolls in the period 2000-2017. 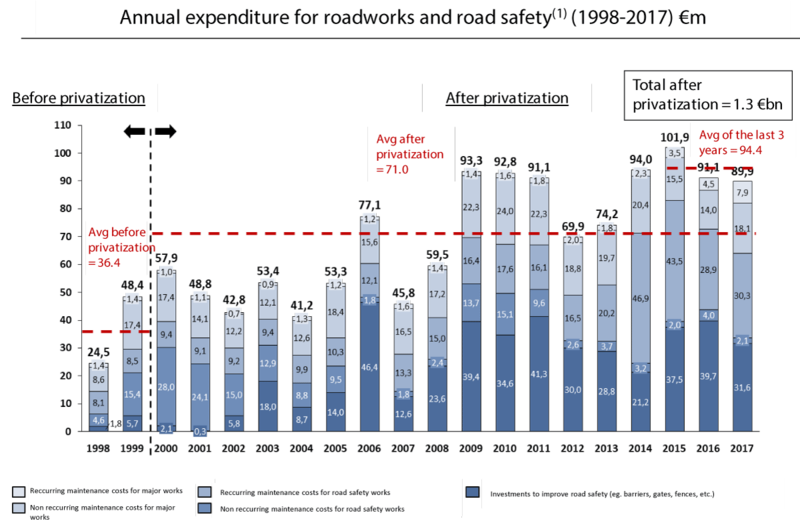 Toll revenue growth was below inflation until 2009, when the return on the additional investment requested by the government following privatisation (in the concession arrangements that became effective in 2004 and 2008) starts to become significant. In the period since privatisation (2000-2017), Autostrade per l'Italia invested €13.6 billion, including €10.3 billion that had no impact on tolls and €3.3 billion that led to toll increases. 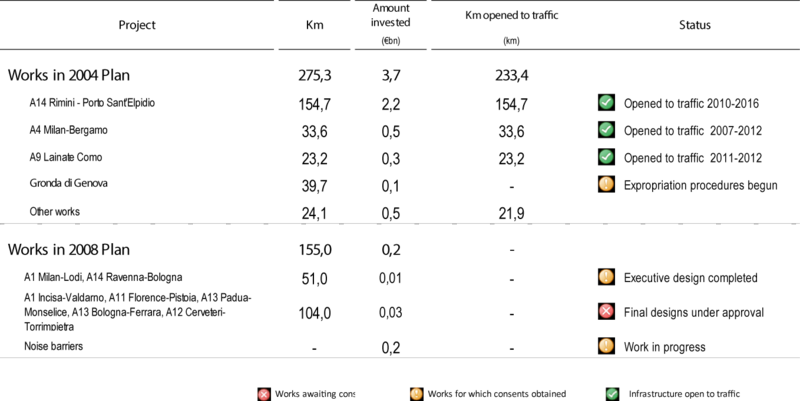 The latter are detailed in the table below. As a result, in the same period, cumulative toll revenue attributable to Autostrade per l'Italia (€42.7 billion) was €800 million higher than the amount that would have been collected had toll increases been equal to the real rate of inflation. This means that in return for the additional toll revenue of approximately €800 million, Autostrade per l'Italia has invested (in addition to the commitments given at the time of privatisation) approximately €3.3 billion. 3. 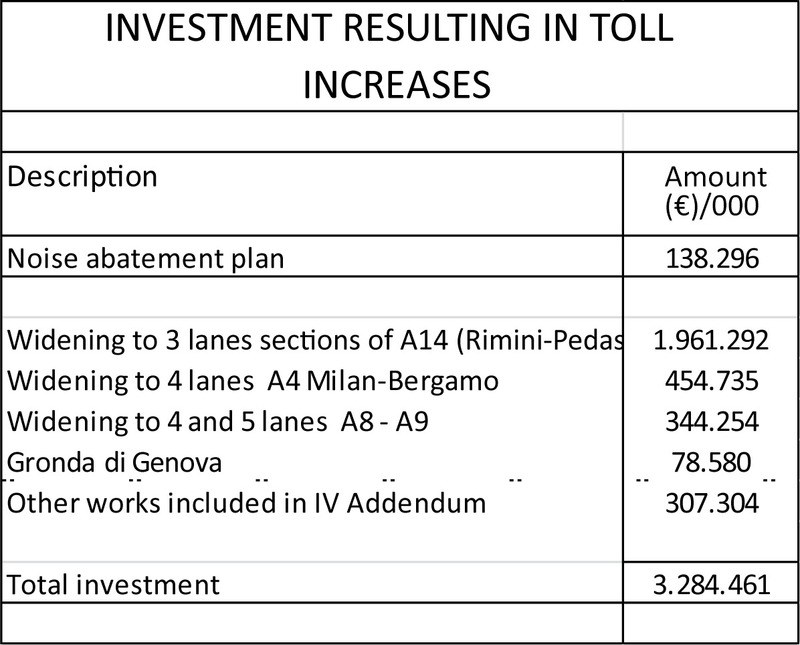 "Autostrade per l'Italia gains from toll increases as traffic levels were underestimated in the Financial Plan annexed to the Concession Agreement." 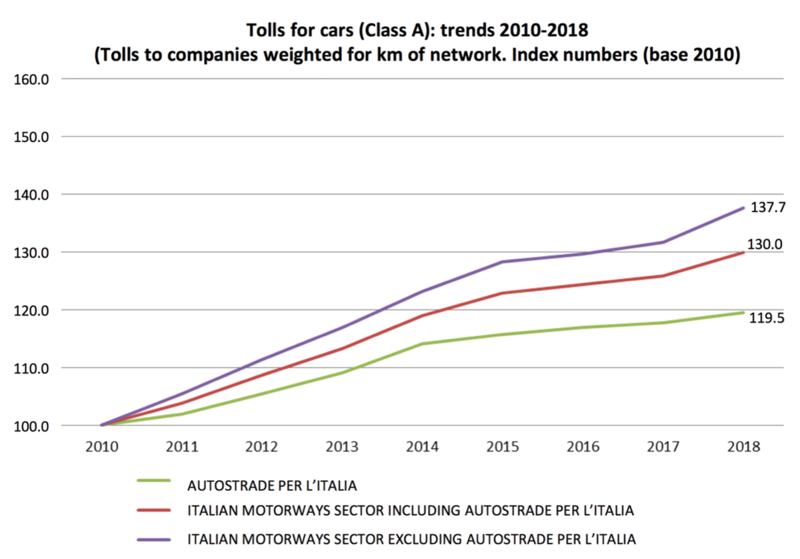 FACTS: With regard to the article, "Here's how Autostrade gains from toll increases", published in Il Sole 24 ore on 20 September, which implies that Autostrade per l'Italia has benefitted from the underestimation of future revenue, it is important to note that traffic growth on the Company's network – measured in km travelled – in 2017 was well below (-18.9%) the projection for 2017 contained in the Financial Plan annexed to the Concession Agreement. This shortfall in traffic resulted in a reduction in revenue which, under Autostrade per l'Italia's Concession Agreement, in effect since 2008, cannot be compensated for through tolls and thus constitutes a form of "traffic risk" borne entirely by Autostrade per l'Italia. 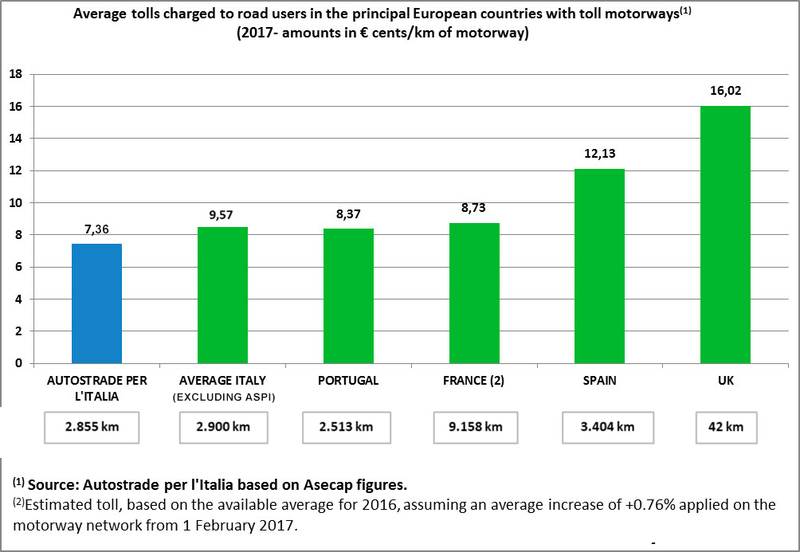 Again with regard to toll revenue, it is also important to consider that a comparison at European level shows that the tolls paid on Autostrade per l'Italia's network are the lowest in Europe: around 40% lower than those paid in Spain and approximately 15% lower than French tolls (for further details, see paragraph 1.3.1). 1. "Since its privatisation, Autostrade per l'Italia has not invested in the upgrade of the motorway network." FACTS: Prior to Autostrade's privatisation, when the Company was still public, the government drew up an Extraordinary Modernisation Plan, estimated to cost approximately €3.5 billion, including the Variante di Valico project. In return, the concession term was to be extended 20 years. The Plan was defined on the basis of brief preliminary designs and without obtaining the formal agreement of local authorities. At the end of 1999, again when the Company was public, a mere €100 million, equal to 3% of the total amount to be invested in Major Works, had been spent. Environmental and town planning consents had been obtained for only 15% of the works. The approval process for the Environmental Impact Assessment for the Variante di Valico project was at a standstill. With the privatisation (in March 2000), Autostrade per l'Italia assumed responsibility for funding any cost overruns incurred during construction of the Major Works included in the Financial Plan annexed to the 1997 Agreement. Related capex, initially estimated at €3.5 billion in 1997, now stands at €7.3 billion, of which €6.0 billion has already been spent. The additional cost of €3.8 billion has remained borne by Autostrade per l'Italia without any toll increase, as provided for in the 1997 Agreement. Autostrade per l'Italia has invested €13.6 billion, a total of €757 million per year, compared with an average of €127 million per year when the Company was in public hands. 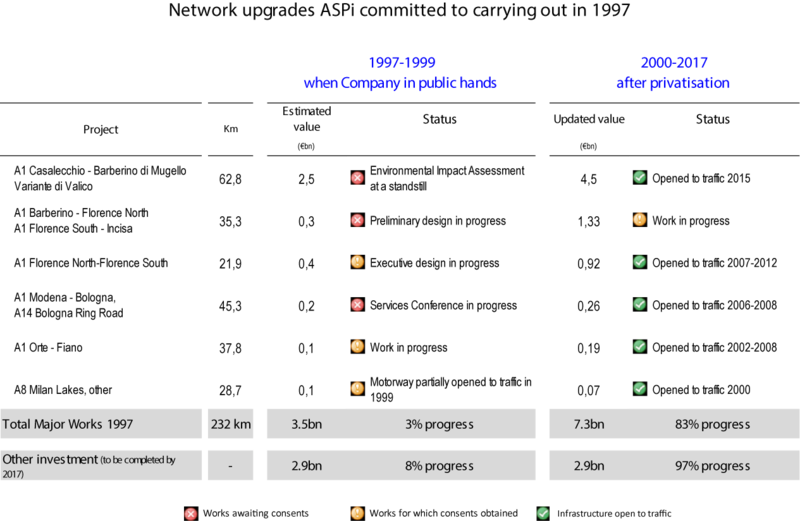 Since 2000 (post-privatisation), Autostrade per l'Italia has, at the government's request in 2002 and 2007, undertaken to carry out additional investment, as shown in the table below. 1) Including upgrade and modernisation work in the form of Major Works and investment in the existing network. 2. "Autostrade per l'Italia is responsible for delays in investment, above all the Gronda di Genova." FACTS: Autostrade per l'Italia has carried out 92% of the investment provided for in the Financial Plan of 2013. The gap between actual and planned investment amounts to approximately €1.1 billion. This is essentially linked to delays in receiving the necessary consents from the relevant authorities (in particular for the Genoa Bypass, the Barberino-Florence North section and the fourth free-flow lane of the A4 between Viale Certosa and Sesto San Giovanni) and in awarding the related contracts following reform of the legislation governing tenders (particularly regarding the Florence South-Incisa section, the noise abatement plan and the fifth lane of the A8 Milan-Lainate). Delays in the authorization process result in increased financial expenses for Autostrade per l'Italia in connection with locked-up funds. 3. "As for the Genoa Gronda bypass project, nothing exists"
FACTS:In relation to the claims made by the Ministry of Transport and Infrastructure (MIT) on the status of the Genoa Bypass: "As for the Genoa Bypass, nothing exists. The project has stopped", Autostrade per l'Italia has clarified that the final design has received both town planning and environmental approval, as well as the declaration of public utility required for expropriation procedures. Expropriation of 98 residential units have been completed to date; the families are finalising their move. The relocation activities of over 30 business are also under way, 27 of which are already complete. All construction site areas (over 270,000 sq. m) have been acquired in temporary occupancy and more than 60% of agreements to remove obstructions have been formalised. The Bypass project began at the start of the year 2000s and has seen years of studies and analyses, including cost-benefit. In 2009, it was the subject of the first ever public debate held in Italy, which lasted over 6 months and concluded in favour of the region, now awaiting the construction. The working plan alone, which is waiting for imminent approval to begin the excavation preparation activities, has 12,000 tables. A clear sign of a complete and solid project. To date, Autostrade per l'Italia is waiting only for the green light on the working plan from the MIT - considered to be imminent - to begin construction activities. 1. "Autostrade per l'Italia's privatisation has not resulted in any improvement in the quality of the motorway service." FACTS: There has been a significant improvement in key indicators since privatisation. the installation of high containment safety barriers. 1. "Autostrade per l'Italia's has spent far less on maintenance than required under the Concession Agreement." FACTS: Following its privatisation (2000), Autostrade per l'Italia has always meet its obligation under the Concession Agreement, with a total of €5.141 billion spent on maintenance in the period 2000-2017, approximately €195 million higher than it committed to spend in the Concession Agreement (€4.946 billion). 2. "Since it was privatised, Autostrade per l'Italia carries out far less maintenance than when the Company was in public hands." FACTS: As shown in the following tables, since privatisation, Autostrade per l'Italia has spent a total of approximately €1.3 billion on infrastructure (bridges, viaducts, flyovers and tunnels) and safety, with average expenditure in the last three years (2015-2017) of €94.4 million per year. This is 2.6 times the average prior to privatisation (€36.4 million). 3. "Autostrade per l'Italia carries out far less maintenance than ANAS and other European operators." FACTS: A recent study by AISCAT shows that Autostrade per l'Italia spends around €108 thousand a year on maintenance per km of motorway (the period 2013-2017), equal to approximately 5 times more than ANAS spends on its network (€19 thousand per year between 2013 and 2016). 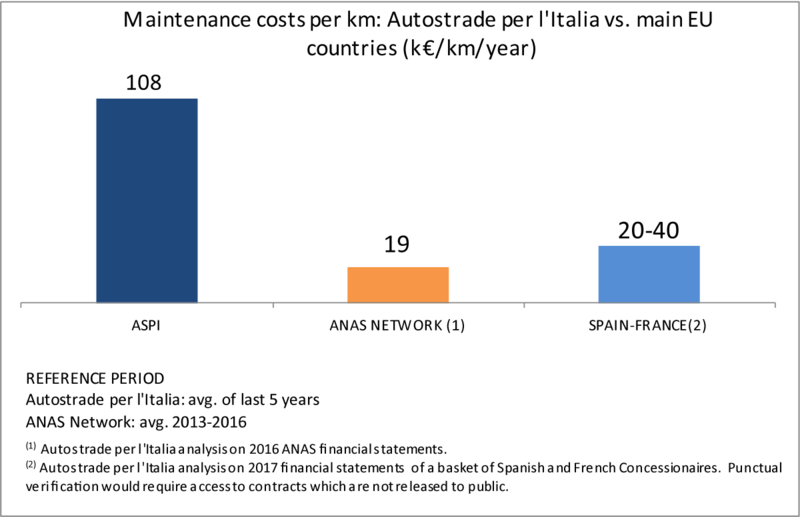 Comparison with a basket of French and Spanish operators also shows that Autostrade per l'Italia spends around 3 times more on maintenance. The comparisons are based on publicly available information and do not take into account the geographical differences between the networks (level or high ground, bridges, viaducts, tunnels, etc.). 4. "Non-routine maintenance results in toll increases"
FACTS: With regard to the article that appeared on the Sole24Ore website on 26 September 2018, under the headline, "Genoa Bridge, ministry: Autostrade postponed works to obtain toll increases", we wish to clarify the fact that both routine and non-routine maintenance works do not in any instance result in toll increases. Anyone can check this by reading the text of Autostrade per l'Italia's Concession Arrangement. 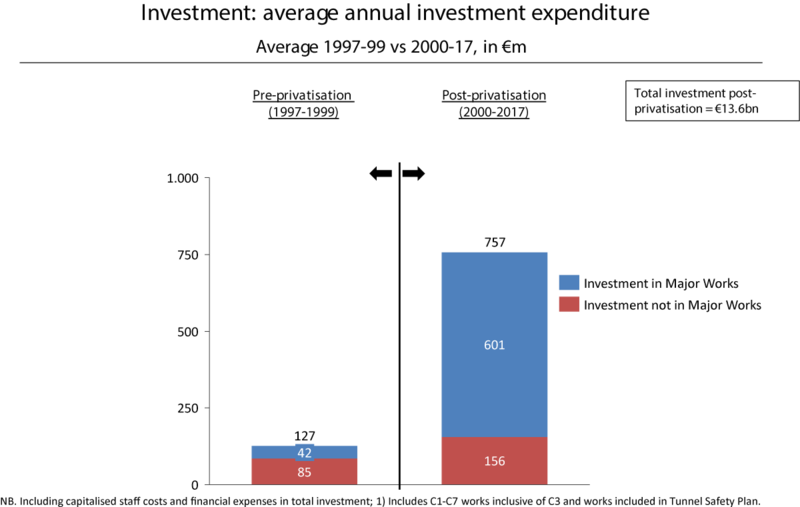 Non-routine maintenance works fall within the scope of the broader category of "Other investment", as defined in art. 2, paragraph 2.C of the Concession Arrangement, and are defined as work on the "modernisation and upgrade of the network operated under concession". The "Other investment" category includes both improvements, such as the retrofit of the Polcevera Road Bridge, and works covered by Section F2, relating to projects of minor entity. All the works included in the "Other investment" category regard expenditure that is capitalised, but on which no returns are earned. The Morandi Bridge was built by Condotte d'Acqua between 1963 and 1967, after the contract was awarded by ANAS following a competitive tender process. The Contracting Entity, ANAS, did not establish technical specifications for the bridge to be built, only indicating the operational requirements (length, the width of carriageways, etc.). It was up to the contractors to propose technical solutions and the Contracting Entity to assess these and select their preferred choice. This way of awarding contracts was in widespread use at the time. The Florence-Bologna section of motorway was itself built using a wide range of technical solutions, reflecting the fact that a number of different contractors were awarded contracts for the various sections of motorway to be built. In the case of the Polcevera road bridge, ANAS selected the proposal put forward by the Condotte d'Acqua group (a publicly owned IRI Group company), based on a design by the architect, Riccardo Morandi. The technical solution adopted was unusual with respect to solutions used for similar constructions at that time (arched bridges, cable-stayed bridges). This technique was used to build very few other bridges around the world (at Maracaibo in Venezuela and on over the Wadi al-Kuf in Libya), all designed by Riccardo Morandi. This bridge design was abandoned in later years. The most peculiar aspects regarded the creation of a balanced system using reinforced concrete stays to support the bridge and handle the pull of the roadway (concrete is weak in tension), with steel rods buried in the concrete and not visible for direct inspection. Practically, the bridge was built by a state-owned company contracted by a state-owned Contracting Entity, using an unusual technical solution and without offering any alternative roads for traffic either within the city or heading in or out of it. There were also initial problems with the bridge. Between 1992 and 1996, Autostrade, then a publicly-owned company (IRI Group) that had assumed responsibility for the bridge in 1967 after testing by ANAS, decided to correct a number defects in the construction of the first balanced system (pylon 11), transferring the load from the existing struts to new external struts and modifying the way in which the struts were attached to the mast in the adjacent balanced system (pylon 10). At this time, Autostrade chose not to use the same approach with the other stays as it was not thought necessary. In 2017, Autostrade per l'Italia's technicians submitted a plan for similar preventive maintenance work on pylons 10 and 9 (the one that collapsed) to the Ministry of Infrastructure and Transport (MIT). 1. "The project was cut to reduce the cost from €26 million to €20 million so that it could be authorised by the Public Works Department alone and did not require authorisation by the Public Works Commission (Consiglio Superiore dei Lavori Pubblici or CSLP), in agreement with the MIT." FACTS: The gross amount authorised by the Board of Directors on 12 October 2017, at the request of the Operational Maintenance and Investment department, was approximately €26.9 million which, as usual, consisted of the cost of the Project (the works to be contracted out) and a sum made available to the Contracting Entity to cover design work, project management and other specialist activities. As regards this particular project, the cost of the work was €20.2 million and the total authorised expenditure was €26.9 million. The cost of the work is the basis for the authorisation which, given that this sum was €20.2 million, quite properly did not require approval from the Public Works Commission (Consiglio dei Lavori Pubblici or CSLP). The Project was thus managed by both Autostrade per l'Italia and the Ministry of Infrastructure and Transport (MIT) in a perfectly "normal" manner, in accordance with the procedures required by law. 2. "The so-called "closed" tender process is typical in the case of "urgent" works, but the Company did not declare this to be the case." FACTS: Whilst awaiting approval for the planned retrofitting intervention, in May 2018, the Company began the process of prequalifying suitable contractors with the necessary technologies, taking into account the complexity of the work to be carried out. The selected bidders were then to take part in the so-called "closed" tender in early August 2018. This procedure (in this case, preselection of up to 7 contractors to take part in the subsequent phase) has been permitted under Italian law since 2016 and allows for the preselection of contractors when contracts are of a specific nature, including those that are particularly complex. There is no doubt that the work to be carried out required certain highly specific expertise, involving the gradual transfer of tension from the internal steel rods (buried within the concrete) to newly positioned external cables, whilst ensuring that the dynamic and static properties of the bridge were unchanged throughout the process of transferring the load. The primary importance of the technical aspects of the contract was borne out by the fact that only 5 companies bid for the contract, when tenders of this amount, but for less specialist work, usually attract an average of about 30 contractors. The prequalification process and use of the "closed" tender process was solely linked to the particular technical complexity of the project and not to its urgency. 3. "Autostrade per l'Italia's Board of Directors decided not to classify the retrofitting of the bridge as urgent." FACTS: It is correct to say that the planned retrofitting intervention was approved by Autostrade per l'Italia's Board of Directors, as the amount concerned exceeded the limit on expenditure that may be approved by managers (€5 million). It is, however, necessary to clarify the fact that it is not the Board of Directors' role to conduct a technical assessment of the projects or to classify them as urgent or emergency (pursuant to Legislative Decree 50 of 2016). This assessment is the obligation of technical managers classified as Contracting Entities, who in such cases do not require the Board of Directors' authorisation and are not subject to limits on expenditure in the event of urgent or emergency work. In addition, the Head of the Area Office has the power and an obligation to independently adopt measures regarding traffic as a result of the need for any urgent or emergency interventions, without any need for further internal or external authorisation. Autostrade per l'Italia's Board of Directors has never, in the last 18 years, discussed or assessed a project's classification as urgent or emergency, leading to implementation of the resulting action. It would have had neither the right nor the authority to do so. Only heads of area offices have adopted such procedures (around 50 each year adopted by the 9 area offices on Autostrade per l'Italia's network). 4. "Proof that the work was urgent is provided in the text of the five letters sent by the Contracting Entity urging a response from the MIT, sent between 6 February 2018 and 13 April 2018." FACTS: As regards to the letters urging a response from the MIT, sent by the Head of Operational Maintenance and Investment, as the Contracting Entity for the work, which was not classified as urgent or emergency, this type of communication with the Ministry is unfortunately necessary in order to cut the time needed for the approval of projects, which in any event – despite the requests – is well in excess of the timing provided for in the Concession Agreement. In 2018 alone, there were average delays of 100 days across all the projects approved, in addition to the 90 days provided for in the Concession Agreement for the approval of projects of this nature. 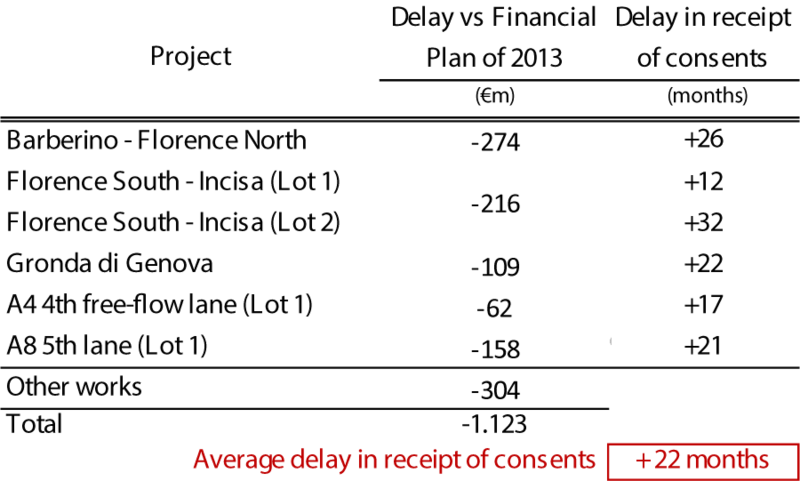 In the case of the retrofitting intervention on the Polcevera road bridge, delay was over 130 days. In addition, again in 2018, the Company's various Contracting Entities sent letters to the Ministry urging a response to requests for approval, consent and authorisation for around 70 projects. The aforementioned letters were sent after 6 February 2018, when approval had already been given by the Public Works Department in Genoa. The purpose of the five letters was, therefore, solely to urge completion of the procedure. 5. "The planned retrofitting of the bridge is, with regard to an assessment of the strength of the concrete, based solely on the results obtained from use of the Windsor method, deemed misleading in 80% of cases in a report by the Public Works Department in Genoa"
FACTS: In order to assess the strength of the concrete during preparation of the plan for the bridge's retrofitting intervention, the destructive testing of materials (samples/specimens) was carried out in 2015 when work on the final design was starting, The results are of proven reliability and were included in the design. Tests using the Windsor method were merely used to compare a current assessment of the strength of the concrete with the assessments carried out, using the same method, during construction of the bridge. They were included in the design solely to provide an indication of the situation over time. Briefly, it is incorrect to say that the design was based on tests carried out solely using a method that gives misleading results. 6. "The 5 inspections of the cable-stays carried out by Spea had failed and the Ministry of Transport was sent an incomplete design by Autostrade." FACTS: It is wrong to draw conclusions from individual survey results included in a complex and highly elaborate design, consisting of hundreds of plans, such as the design for the retrofit of the Polcevera Road Bridge. In this way, there is a risk of reaching conclusions that bear no relation to reality. In this specific case, the 5 allegedly failed tests were in reality attempts to check the level of tension of the concrete encasing the stays, using procedures that were not standard. To be carried out correctly, these tests should have involved the use of a core drilling machine to extract material from the entire thickness of the stay. This was obviously not possible in this case, given the presence of steel rods within the cable-stays. The inspectors thus attempted to check on the level of tension by taking surface samples, an approach that was unable to provide any legible results. Moreover, the level of tension of concrete was determined by modelling, the results of which were included in the design. The state of repair of the concrete was also assessed through compression testing, which gave results in line with the original design. These results were also included in the design for the retrofit. In addition, with regard to the alleged lack of a final design, Autostrade per l'Italia notes that final designs are prepared and submitted to the Ministry when the related environmental impact assessment is needed and in order to check compliance with urban planning regulations via the Services Conference and obtain the declaration of public utility required for the purposes of expropriation. In this case, in common with all designs for non-routine maintenance, it was not necessary to obtain the above consents. It was, therefore, not necessary to submit the final design to the Ministry. In any event, in order to the prepare the design internally, Spea was contracted to carry out the three design stages (preliminary, final and detailed) so as to follow the process more closely, in part with the involvement of external consultants during the various stages. 7. "One of ASPI's engineers had 62 queries regarding the deterioration of the Polcevera Road Bridge, but the results of his assessment were ignored"
FACTS: In relation to the article in la Repubblica with the headline, "Engineer's warnings ignored by Autostrade. Beams can no longer take the weight", on 27 September, which refers to a number of warnings to Autostrade per l'Italia mentioned in the final report of the Ministry's Inspection Committee on the Polcevera, the company's technical units wish to clarify a number of points. It is important to note that the 62 queries made by Mr Claudio Bandini formed part of normal discussions between a verifier and a designer, which are structured as follows: first, the verifier sets out any queries and requests clarification, to which the designer promptly responds. Final discussions then take place, after which the final verification report is issued. In this specific case, all of Mr Bandini 62 queries were looked at by Spea's designer, who provided an appropriate response and gave resulting guidance to the Project Manager - Responsabile Unico del Procedimento (RUP), Mr. Paolo Strazzullo, to enable him to complete work on the design. The Project Manager checked that the resulting requirements were met, setting out his conclusions in the technical validation report submitted to the Ministry of Infrastructure pursuant to art. 26 of Legislative Decree 50/2016 and attached to the design for the retrofit. Bandini's remarks were thus not "ignored", but actually helped to improve the design. With regard, on the other hand, to the rating of 0.58 assigned to certain of the Morandi Bridge's beams, it should be noted that this in no way related to tests carried out on the bridge by Spea. This was the result of checks of calculations, carried out solely on a theoretical basis, made necessary following the entry into force, in 2008, of new legislation governing bridges, in order to plan upgrades of the assessed parts of the bridge. The rating of 0.58 does not in any way, therefore, refer to the "state of disrepair" of the bridge. Finally, with regard to the failure to comply with requirements for earthquake zones, we can confirm that a safety assessment document was not needed for the Polcevera Road Bridge, as the bridge was not located in a category one or two earthquake zone, but was in a category 4 zone not requiring preparation of such a document. As part of his assessment, Bandini simply requested a list of the approvals and consents required by law for such a project and for the stage of design under examination, including earthquake-related requirements (such as, for example, those relating to submission of the design to the Public Works Department, also required for category three or four zones). There is, therefore, no inconsistency between statements made by Autostrade per l'Italia's technical units in the letter sent to the Ministry on 23 June 2017, the content of the design for the retrofit and the verification report prepared by Mr. Bandini. 8. "Autostrade per l'Italia wrongly classified the retrofitting project as a "local intervention" to avoid the precautionary controls and static tests that are foreseen for interventions relating to upgrading and improvement"
FACTS: In relation to statements attributed to the officials of the Ministry of Transport and Infrastructure, published in a number of media on the alleged irregularity of the classification as "local intervention" attributed by the designer and technical departments of Autostrade per l'Italia to the Morandi Bridge retrofitting project, which was approved by the Board and by the Ministry, Autostrade per l'Italia's technical departments deem it necessary to specify that the decision was made in strict compliance with the Ministerial Decree dated 14 January 2008. This decree exclusively governs "the general criteria for the assessment of safety and for the design, the execution and testing of interventions on existing constructions". The Decree classifies interventions "that concern single parts and/or elements of the structure and affect limited portions of the construction", that do not cause "substantial changes to the behaviour of other parts and of the structure as a whole" and that result in "an improvement in the pre-existing safety conditions" as local interventions. This perspective fully included the Morandi Bridge retrofitting project, which only acted on the stays and concerned two piles – 9 and 10 – out of a total of 11 piles on the Bridge, equal to less than 200 metres versus the bridge's total length of 1,102 metres. Moreover , the interpretation of the intervention as being "local" was shared by all the institutions that approved the project, from the institutional offices to the Ministry. The final project was also validated by Edin, the company headed by Professor Brancaleoni, "that agreed on the basic assumptions of a regulatory nature and the methods of analysis". It should also be recalled that the results of the technical monitoring, partly carried out by external consultants, focused on the efficiency status of the stays were clearly reported within the same Morandi Bridge retrofitting project. These results were therefore known to the Ministry, to institutional offices and external consultants, none of which – along with the company's technical departments – ever believed there were any reasons for alarm or urgency. 1. "CESI recommended continuous dynamic monitoring of the structure. CESI's technical experts are now aware that the Company effectively followed this advice." the working order of the bridge through dynamic assessment of balanced systems 9 and 10. In addition to assurance of the control and monitoring system used by Autostrade per l'Italia, CESI's final report suggested the adoption of continuous dynamic monitoring technologies. These conclusions were classified by CESI as "recommendations". And they were included in the Bridge Improvement Plan. 2. "The Polytechnic University of Milan recommended the urgent installation of sensors to monitor the state of the Bridge. This recommendation was ignored by Autostrade per l'Italia." FACTS: The opinion issued by the Polytechnic University of Milan, to be used when planning the work, was requested in June 2017 by SPEA, who had been awarded the contract to design the improvements to be made by the Contracting Entity, Autostrade per l'Italia's Operational Maintenance and Investment Department. The Polytechnic's report was issued on 25 October 2017. The SPEA engineers who received the Polytechnic's report implemented the recommendation, including a control system based on the use of sensors in the design submitted to the MIT just a few days later on 31 October 2017. The full report issued by the Polytechnic, together with the monitoring results, were included in the Project documentation submitted to the MIT and Genoa's Public Works Department. Like the designer, nobody recognised a need for urgency. FACTS: The contract between ASPI and Cesi was for the provision of "Specialist assessment and validation of the system for monitoring and structural checks". 4. "Spea omitted to give Prof. Gentile from the Polytechnic University of Milan information on the bridge's state of repair. With the beams having a safety rating of 0.58, the bridge should have been closed immediately "
FACTS: With regard to the statements made by Prof. Gentile from the Polytechnic University of Milan in interviews published in a number of today's newspapers, Autostrade per l'Italia's technical units wish to state that – based on the information provided by SPEA and already made public yesterday – that the safety ratings below one for the roadbed beams were sufficient. These ratings were determined in application of the new building regulations that came into force in 2008 and, contrary to what has been stated by Prof. Gentile, do not in any way describe the bridge's safety status. And they could not, therefore, indicate the need to close the Morandi Bridge to traffic on the part of the Area Office, the sole entity with the power to take such decisions. This information was attached to the design submitted to the Ministry of Infrastructure and Transport in October 2017 and did not raise concerns among any of the experts involved in the assessment. The text of the approval of the design by the Public Works Department stated: "overall, the detailed design examined appears to be well-prepared and complete in every aspect. The design has been drawn up using exemplary methods, not only in terms of assessment of the existing structures, the effects of identified disrepair and reinforcements, but also bearing in mind the enormous amount of monitoring and control data gathered over previous years". Finally, as already clarified by SPEA, Prof. Gentile had received all the information and documentation necessary for him to carry out his engagement, which consisted solely in assessing the cable-stays and no other parts of the Bridge. This assessment did not highlight any need for urgent attention, and Prof. Gentile himself never requested any additional documentation that may have regarded a cause-effect relationship with the dynamic testing of the cable-stays that were the focus of his engagement. Therefore, his statements regarding Spea's failure to provide him with the relevant documentation should, like his assessment of the safety status of the beams in the Polcevera Road Bridge, which were at no time his concern, be considered erroneous and inaccurate. 1. "Autostrade per l'Italia did not carry out maintenance on the Morandi bridge." FACTS: The Morandi Bridge, due to the technically complex nature, was always subjected to continuous, ongoing monitoring and regular, specific maintenance. Autostrade per l'Italia spent more on the Bridge per kilometre than the average spent on other bridges and road bridges in the network. In the period 2015/2018 (until 14 August), work was underway on 926 days, equal to a weekly average of 5 days out of 7 and work on replacement of the cable-stays was about to begin. Proof of the degree of attention to the Polcevera road bridge paid by Autostrade per l'Italia can be found in the headline in the Secolo XIX newspaper the day after the collapse: "The bridge where work never stopped collapses […]". It is, therefore, totally untrue to say that the bridge was not maintained. 2. "The Morandi Bridge: before the collapse, there were broken beams and cables that were 75% corroded." FACTS: With regard to the reconstruction and pictures contained in the article published in the weekly L'Espresso on 13 September, under the heading "Morandi Bridge, shocking photos taken before the collapse: broken girders and cables 75% corroded", it is necessary to provide a series of key details and clarifications in order to put the facts cited in the article into the correct perspective. Firstly, the inspections carried out by Spea's engineers in May 2013, and the resulting report, did not in any way regard the cable-stays, but related solely to the roadbed beams between pylons 4-5, 5-6 and 9-10. Spea's report noted some deterioration in the state of the inspected parts, as highlighted in the L'Espresso article with supporting pictures. Following the report, Autostrade per l'Italia's technical units took immediate action to rectify the defects identified, carrying out a series of extraordinary maintenance works. These were completed by the contractor, Soteco, between 2014 and 2016. The pictures and information taken from the Spea report of 2013 thus describe a situation that had already been dealt with. Referring also to the diagnostic testing of the cable-stays of pylons 9 and 10, carried out by Spea in the period 2015-2016, the L'Espresso article states that the tests found that just one of the stay-cables was 75% corroded. It is important to clarify that each cable-stay consists of 52 cables, in turn made up of 464 steel strands. The inspection conducted by Spea on all the cables via sampling (in January 2016) and reflectometry testing (in stages in the period 2015-2017) had identified an average degree of corrosion in the order to 20%, in no way sufficient to compromise the static load-bearing capacity of the bridge, as confirmed in the technical report on the tests. Repairs to the cables analysed was to form an additional part of the retrofit project, approved by the Ministry of Infrastructure and Transport in June 2018. The official facts and reports thus confirm that Autostrade per l'Italia's technical units took immediate action, following the inspections conducted by Spea, in order to restore the beams to their normal state, that the overall corrosion in the cables in the cable-stays did not in any way have the importance given to it in the article and that their condition had no impact on the safety of the bridge. 3. "Emails between Autostrade per l'Italia and SPEA show that checks on the road bridge were inadequate." FACTS: In response to a number of press articles, in which reference is made to certain emails from Autostrade per l'Italia's technical units allegedly showing that the checks carried out by Spea on the Polcevera road bridge were inadequate, it should be noted that communications between the Contracting Entity for the work and Spea need to be interpreted within the context of a routine exchange of views between a customer and supplier. Such exchanges also occur in the case of other design or project management contracts (over 100 alone in 2018) entered into with external professionals other than Spea. Specifically, with regard to work on the upgrade of safety barriers for the Polcevera road bridge, in February 2018, Autostrade per l'Italia's technical department claimed that Spea had failed to comply with its contractual obligations. In response, Spea removed the Works Supervisor from his post, thereby enabling the work to proceed fully in accordance with the Contracting Entity's requirements. This sort of customer-supplier relationship thus proves that the system of controls is effective and fit for purpose, rather than the opposite. It is also crucial to note that these exchanges regard work taking place at different locations and at a distance from pylon 9, which was involved in the collapse. These activities are thus totally unrelated to the events in question. 4. "The bridge crane assembled under the framework of the Morandi Bridge did not work for a long time, making it impossible to check the structure. Its installation could also have caused damage to the viaduct." FACTS: Two bridge cranes were installed over the years on the Morandi Bridge: the first was installed at the end of the '80s, following works aimed at recovering certain shortcomings attributable to the original construction. This structure was later removed and duly disposed of in 2014 by Metaljob, given that it was no longer in line with the safety regulations for self-powered suspended structured. As regards the new bridge crane, the design and on-site supply of which were entrusted to Weico in 2015 (once the old structure had been removed), it should be noted that the installation and activation thereof, as at the date of the event, were in a stage of completion and testing. In any case, the surveillance activities on the road structure, even in the absence of the bridge crane, were constantly performed through the use of special vehicles (by-bridges) which enable each structural part of the road structure to be inspected. The new bridge crane was installed by means of a precise control, long the extension of the entire structure, of the anchorage areas of the track supports. It was therefore necessary to proceed with a series of anchors along the outer walls of the road structure. These anchors were preceded by a survey, using specific equipment, which allowed for the correct tracing of the prestressing cables, in order to prevent the perforations from interfering with them. In relation to the content of the report by the Supervisory Commission of the Ministry of Infrastructures and Transport on the Morandi Bridge collapse, as already published by the press, Autostrade per l'Italia stresses that the report does not take into account the clarifications provided by the Concessionaire's engineers during the Hearings held at the Commission's request. Furthermore, the company's engineers have not yet had access to the sites seized by the Public Prosecutor of Genoa and, therefore, the opportunity to carry out the analyses and inspections necessary to posit the dynamics and reasons for the collapse. Nor, for that matter, have the latter been clarified by the Commission (whose members, on the contrary, have had access to the sites). In this context, the responsibility of Autostrade per l'Italia hypothesised by the Commission can only be deemed mere speculation still to be fully verified and demonstrated, considering that the Concessionaire has always conducted itself in full respect of the law and with total transparency towards the Grantor. As regards the numerous aspects of the report known to the press, the technical structures of Autostrade per l'Italia have clarified, with respect to the absence of the safety assessment document, that said document (pursuant to OPCM no. 3274 of 2003) is only required for infrastructures situated in seismic zones 1 and 2, whereas it is not required in zones 3 and 4, where the Morandi Bridge is located. It is also important to specify that the communication sent by the company to the Ministry on 23 June 2017, cited by the report as an omissive accusation, concerned an entirely different matter relating to the monitoring criteria, not the safety assessment. As regards the alleged "minimisation" of maintenance interventions the company is accused of, Autostrade per l'Italia reminds that it has spent approximately €9 million in the past three and a half years in order to increase the safety of the bridge, and that in 2015-2018 there were 926 construction days, equal to an average of 5 construction days per week. Regarding the interruption to structural works on the viaduct after 1994, following the highly important interventions in previous years, the company notes that - based on the information provided by the technical structures - the interventions carried out before 1994 were essentially to correct design and construction errors on the Morandi Bridge, then resolved by the works in 1994. Since then, the situation has been constantly monitored by the technical structures and in 2015, led to the decision to carry out the retrofitting works on the bridge. In relation to the accusations in the report on the retrofitting works' excessive design time frames, on the project's exclusively internal development, and on the inaccurate works schedule, Autostrade per l'Italia reminds that the Polytechnic University of Milan and the company EDIN - in addition to SPEA - contributed to the development of the overall project. No risk or urgent element was raised by the designers, nor by the Commission of the Public Works Authority, which assessed and approved the project. As regards the complaint about the designer's lack of accuracy when assessing the state of conservation of the stays, which was the result of an optimistic evaluation and not based on a direct analysis of the reduction of the section, the technical structures of the company remind that the analyses on the stays beneath concrete were only possible indirectly through reflectometry testing. The diagnostic analyses were attached to the project and were assessed not to be dangerous by all engineers, internal and external to the company, who were able to conduct and examine them. Regarding the disputed decision - within the project - to carry out the works in the presence of traffic, the company reminds that the operating methods provided by the project approved by the Ministry in 2018 were similar to those followed in 1991-1993 for similar and uncontested works, and that these nevertheless foresaw various phases of closure of the bridge to traffic. With no elements of risk or urgency. It is also important to add that the Authority had deemed the retrofitting project "well written and complete in every detail, designed in a methodologically exemplary manner not only in light of the checks on the existing structures, the effects of disrepair encountered, and the reinforcements, but also taking into consideration the vast amount of monitoring and control data collected gradually over the past years". On the other hand, concerning the disputed decision not to close the bridge to traffic, it is noted that this decision was not made by the Trunk Director of Genoa, since the risk conditions that would have justified it were non-existent, based on the analyses and monitoring carried out. Furthermore, the company fully rejects the complaints about the unsuitability of the control procedures; these have always been applied through the convention contract with SPEA in place since 1985. The control system, subject to examination by the Grantor back in 2017, is entirely compliant with legal obligations and has never been the object of any survey by the Grantor. 2. "Autostrade per l'Italia's top management did not provide exhaustive answers to the questions posed by the Ministry of Infrastructures and Transport's Committee on the collapse of the Morandi Bridge"
FACTS: In relation to the reconstruction of the minutes of the hearings of the Investigative Committee of the Ministry of Infrastructures and Transport on the collapse of the Morandi Bridge, which appeared in the newspaper La Repubblica, Autostrade per l'Italia expresses concern and surprise as regards what has been reported, having offered, since the moments following the tragedy, the most extensive, transparent and committed collaboration to institutions and competent authorities. It should be noted that the minutes of the hearings of the Ministerial Committee - which, according to what was declared by the Chairman of this Committee, were to be sent to the parties concerned within a week - now over a month later, have still not been sent to said parties, nor have the records. It is surprising that they were made available to the press. It should also be noted that the subject of the hearing, based on the request for convocation, was supposed to be the resolution of the company's Board of Directors that had approved the retrofitting intervention and the seismic analyses - completed or in progress - on viaducts with a span of over 30 metres. The Chief Executive Officer and Central Operations Manager, heard by the Committee, provided explanations regarding the two matters subject to analysis. However, the hearing was infact almost immediately veered towards a series of questions relating to the causes of the event, technical issues and other detailed aspects, with respect to which the executives clarified that they have no detailed information, regarding which, as is known, an investigation is being carried out by the judiciary. Regarding these issues, the Chief Executive Officer asked for a detailed list of questions to be drawn up, to enable the provision of prompt feedback from the company's technical departments. This request was never received by the company. One final consideration is that the proceedings set up by Committee fall outside of every rule: interviews with no report, which are made public and changes of topics from those provided for in the call. However, even more serious is the prejudicial nature of the conclusions. Just 9 days after its full constitution, the Committee reached its conclusion not only to identify the likely causes of the collapse, but also to rule out any responsibility of those who contributed to preparing and approving the retrofitting project. A precocious conclusion that has been publicly criticised, even by the Genoa Public Prosecutor. 3. "Beam verification values indicated that the bridge was not safe and control systems adopted by Spea on the infrastructure were inadequate"
FACTS: As regards reports pubblished by the newspaper La Repubblica on the verification values of the beams of the Polcevera Viaduct, referred to as "unacceptable" by the Investigative Committee of the Ministry of Infrastructure and Transport, given that they were considered to be below the Bridge's safety level, Autostrade per l'Italia's technical departments reiterate that these values gave no indication of the Morandi's safety level. The details contained in table Sp002 mentioned by the article – also known and clearly included in the retrofitting project documentation, accessible to the Ministry and Directorate and positively assessed by the latter - merely indicate what the safety margin would be with the application of the regulations that came into force in 2008. These regulations established new assessment criteria that, being very different from the previous criteria, are not binding but are to be considered on in the case of new projects or heavy structural interventions. Furthermore, the retrofitting project documentation, which provided for the alignment with the new 2008 regulations, clearly indicated that the safety margin of the Morandi Bridge, calculated using the regulations in force at that time, were equal to approximately 1. A, proving the infrastructure's confirmed safety. The new regulations on construction techniques only applies to final projects which, in 2008, had not yet been approved by the Services Conference. The regulations are therefore not retroactive. Otherwise, most of the buildings in Italian cities and the infrastructure currently existing in Italy would need to be demolished and rebuilt. On the other hand, as regards the inadequacy of the monitoring activities carried out by SPEA, it should be noted that said activities are based on methodologies provided for by law, constantly applied in Italy since 1985 and repeatedly shared – on the latest occasion in 2017 - with the Ministry of Infrastructure and Transport. A score of 43, according to the user manual in force within SPEA and known by Autostrade per l'Italia, indicates a structure "to be reported" but with no deterioration of the bearing capacity, with a suggestion to schedule an intervention to be carried out in the medium to long term. This indication was implemented into the retrofitting project, approved by the Ministry, in which all this information was clearly contained. 1. "Autostrade per l'Italia has asked its employees to provide compensation for the victims of the collapse." FACTS: Contrary to the assertion contained in the article in "La Verità", published on 16 September, and picked up by other media, it should be noted that the fundraising to help the victims' families was organised on the initiative of a number of staff, moved to take action, and was entirely voluntary. Each employee was free to choose whether or not to contribute one or more hours' pay in order to raise the funds. This was an initiative that Autostrade per l'Italia simply decided to support and that has, and in no circumstances could have had, anything to do either with the emergency funds provided by the Company to residents and businesses in the so-called Red Zone, or with the €500 million plan for the city of Genoa announced at the press conference in Genoa on 18 August this year. 2. "Compensation: anyone receiving money now must give up their right to any future claim." FACTS: The form referred to in a number of critical press articles – requiring the beneficiaries of compensation to waive any further claim in relation to the specific event for which they are being compensated – is "unique" of its kind. This is a sort of receipt that the Company has only asked the employees of two companies (Amiu and Tecnotatti) whose premises were located beneath the road bridge, and whose vehicles were damaged or destroyed as a result of the collapse, in return for immediate compensation. As this was a case of easily verified material damage, Autostrade per l'Italia has made a final payment covering the full value of the vehicles concerned. This is therefore a particular case. It has nothing to do with all the other forms of non-repayable compensation paid so far by the Company, regardless of any future claim and without asking beneficiaries to waive any additional rights, as clearly indicated in the related forms. 3. "The technology used by Spea to monitor the Polcevera's cables was deemed to be inadequate by a study carried out by Zurich Polytechnic in 1997"
FACTS: To monitor the Polcevera Road Bridge, Spea's technical units involved in overseeing and monitoring infrastructure on behalf of Autostrade per l'Italia have, for over 15 years, used a reflectometry technique – known internationally as RIMT2 – that is completely different from the one used at the time of the study conducted by Zurich Polytechnic in 1997. Zurich Polytechnic's analysis is based on a standard of reflectometry technology that is practically no longer in use. In 1997, the Polytechnic stated that, at that time, there were no certain methods of inspection and monitoring capable of providing for a full assessment of prestressing cables used in existing structures. From 2000, in fact, the technique used in reflectometry testing, known as RIMT, was radically modified and modernised thanks to a number of scientifically validated trials. This resulted in the new RIMT2 standard. This consists of a more powerful data acquisition system that makes it possible to maximise the reliability of the measurements taken. In addition, standardisation of the procedures used in analysing the electronic signals enables any problems to be identified in far greater detail than the previous standard of this technology ever allowed. Over the years, the reliability of the new RIMT2 system has been verified several times by international scientific studies and in a number of field trials. This enables experts to accurately assess phenomena such as corrosion and obstruction or deterioration of the sheathes. 4. 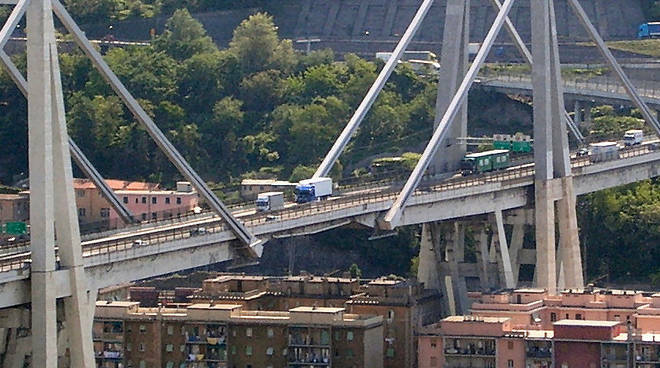 "As far back as 2001, Autostrade per l'Italia requested estimates of the cost of demolishing the Polcevera Road Bridge as it knew that it was unsafe"
FACTS: In relation to press reports regarding plans to demolish the Morandi Bridge dating back to the early 2000s, Autostrade per l'Italia notes that, since 2001, it has looked at various options for upgrading the motorway network serving Genoa. This resulted in the planned Gronda di Genova (Genoa Bypass) being already included in the Financial Plan in 2002, which was also linked to plans for demolition of the Morandi Bridge. During the public consultation on the Gronda in 2008, the company also developed the design for construction of a new 8-lane bridge over the Polcevera alongside the current bridge to serve the existing motorway and the new Gronda, with the aim of using the same road corridor. Following construction of the new bridge, the existing one was to have been demolished. The proposed bridge alongside the Morandi Bridge was shelved during the public consultation, with preference being given to a crossing over the Polcevera to be located further upstream. But prior to this decision taken as part of the public consultation on the Gronda, the company – in order to obtain a full assessment - asked Despe to conduct a feasibility study. This study has been updated in recent weeks and forms part of the proposal to demolish and rebuild the Bridge submitted to the Special Commissioner. Plans to demolish the Morandi Bridge, dating back to 2001, were, therefore, never drawn up in response to concerns regarding the bridge's safety, but always in relation to construction of the Gronda. In relation to the article entitled "Unrest amongst Genoese management employees", the Genoa Stretch Management of Autostrade per l'Italia considers it important to inform readers of the newspaper of the fact that, following the Morandi Bridge tragedy, it has implemented a series of actions to manage the new road network situation which has been created within the Genoa area to maintain its employees' working conditions. Since 23 August, based on an agreement reached on that date with the trade unions, the Genoa Stretch Management hired 9 more people into its workforce to cover the toll booths in the urban area of Genoa and reorganised the road network services to cope with the new demands. The Genoa Stretch Management has also planned for approximately 30 hires in the payment collection, operation and systems departments, which will enable the extraordinary situation to be managed, thus minimising the need for extra shifts by those currently working within said Management. It is important to specify that, to date, overtime has always been used on a voluntary basis, in full compliance with the law and the need to recover the workers' psychological and physical energy. Specifically, only in very few cases and due to sudden absences of other payment collectors have 12-hour days been worked, interspersed with rest breaks. In all these cases, the obligation of 11 hours' paid rest breaks per payment collector, before commencing a new working day, has always been complied with. The Genoa Stretch Management's primary goal is to ensure that workers' safety conditions are never jeopardised when carrying out their work activities. Lastly, the Management expresses its heartfelt gratitude to all employees who, despite working in a situation of objective difficulty, have so far carried out their duties with great commitment and spirit of service. 6. "Provision of vehicles to the Traffic Police in Genoa by the Genoa Territorial Offices (Tronco) "
In relation to the article "Police mocked by Autostrade" published on the 10th of November 2018, it is important to underline that the vehicles supplied by Autostrade's Genoa Terroitorial Offices (Tronco) and mentioned in the article represent a first and immediate response by the company to satisfy the requirements of the Italian Traffic Police in the city of Genoa following the events of 14 August. The vehicles provided were perfectly functional, safe and well-maintained. Furthermore, their mileage (approximately 161,000 mi) was well within the standard limit agreed by the Ministry of the Interior and AISCAT (Italian Association of Toll Motorways and Tunnel Operators), which is approximately 186,000 miles. Furthermore, Autostrade per l'Italia has requested an integration to its plan for the provision of new vehicles. It began a public tender to bring the supply of vehicles in line with the requirements of the Traffic Police in Liguria – requirements that emerged following the collapse of the Morandi Bridge. The procedure envisages time frames fixed by the law and the company pledges to complete the purchases as soon as possible, with the first supplies of the new 2018-2019 batch to be destined to meet Genoa's requirements. It is therefore misleading and far from reality to suggest that Autostrade per l'Italia has in any way "mocked" Genoa's Traffic Police, with whom it has an ongoing collaboration. In reality, taking all facts into account, it is clear that the opposite is true. 7. "Talks are underway between autostrade per l'italia and a number of families from the red zone for immediate reimbursements"
In relation to the information published by a number of newspapers on the alleged negotiations between Autostrade per l'Italia and the families of evacuees of Genoa's Red Zone, the company categorically denies that talks of any kind are under way to reimburse those citizens beyond the rules of the Regional Programme of Strategic Intervention (PRIS). The only sums paid by Autostrade per l'Italia in support of the families of the Red Zone, as widely communicated over recent weeks, were contributions aimed at addressing their immediate basic needs following the Morandi Bridge tragedy. These initiatives were carried out in collaboration with the Municipality and Region. The company does however recall that it is directly bearing the compensation for the victims' families, having already been in contact with their legal representatives over the past weeks to speed up the regular procedures required by the insurance companies. 8. "The Autostrade per l'Italia managers signing off on the documents relating to the Genoa Bypass (Gronda di Genova) are the same managers being investigated by prosecutors for their role in the collapse of the Morandi Bridge"
FACTS: With regard to statements made by the Deputy Minister, Rixi, who has suggested that construction of the Bypass may be subject to "delays" due to the fact that "at the moment, the Autostrade per l'Italia managers signing off on the documents relating to the Gronda project are the same managers being investigated by prosecutors for their role in the collapse of the Morandi Bridge", Autostrade per l'Italia wishes to clarify that, in actual fact, all the documents relating to the Gronda project have been signed by Mr. Tomasi and Mr. Selleri in their respective roles as the Contracting Entity (Committente) and Project Manager (Responsabile Unico del Procedimento), and that these gentlemen are not under investigation by Genoa Public Prosecutor's Office. The Company also wishes to note that, in August, the detailed designs for the Gronda were submitted to the Ministry of Infrastructure and Transport, whose final approval is necessary before construction work can begin. 9. "Autostrade per l'Italia's letters to the Special Commissioner represent a formal action against the reconstrucion of the Morandi bridge"
FACTS: In relation to the articles published by newspapers Il Secolo XIX and La Stampa on 23/11/18, Autostrade per l'Italia clarifies that the correctly reported information refers to an accompanying letter to the final design sent by the company to the Commissioner on 15 October 2018 as part of the Agreement obligations. Autostrade per l'Italia then further developed the project to working plan level and promptly informed the Commissioner of this. Interpreting these letters as a formal action against the reconstruction of the Bridge is entirely inappropriate. From the first moments following the tragedy, Autostrade per l'Italia has always worked towards a reconstruction solution in line with the expectations of the Local Authorities that guarantees very strict times of execution. 10. "The Pecetti Viaduct on the A26 highway is not safe in that its reinforced cement and internal steelwork elements show signs of damage"
FACTS: With reference to the article published in the newspaper La Repubblica on 05/12/2018, entitled "Genoa investigates another viaduct. Super articulated trucks stopped and MIT Ministry inspection", the Autostrade per l'Italia Genoa Section Management specifies that the A26 Pecetti viaduct is absolutely safe and the damage mentioned in the article does not imply any problem for safety. The engineering company SPEA, following the last quarterly inspection conducted on the viaduct, suggested scheduling maintenance operations on a deck beam in the short term (within a period of two years, as envisaged by the score of 60 assigned by SPEA to the infrastructure). This operation was started last October by the Section Management - also adopting correlated traffic limitation operations and installation of scaffolding - and will end in mid-January 2019. The works are currently underway with preparation of the involved surfaces for the introduction of carbon fibres. Subsequently, metallic structural steelwork elements will be installed which are necessary for introducing additional cables which will allow further reinforcement of external precompression. It is also specified that no limitation of heavy load traffic has been imposed. Section Management has simply issued a general requirement that allows these loads to transit on the involved section only once the necessary technical checks relative to the vehicle have been conducted. 11. "Controls conducted on the motorway network show no danger. Score of 50 in no ways indicates structural and safety problems"
Concerning some information circulated by the media on the safety condition of some viaducts, for the avoidance of doubt and manipulation, Autostrade per l'Italia hereby clarifies that the checks conducted on the 66 most important works of the managed network – and for which the company has punctually provided information to the Genoa Public Prosecutor – show no situations of risk or danger. These checks were carried out by third-party companies, as integration and verification of those routinely carried out by Spea. In particular, we hereby specify that the "scores of 50" which refer to some individual elements of the monitored works, do not indicate in any way whatsoever problems of a structural or safety nature and they allow maintenance operations to be planned within 5 years. Moreover, on the Autostrade per l'Italia network, not even one situation exists that requires immediate intervention in order to guarantee restoration of safety (a "score of 70"). The company will continue in the checking and verification operations on the network, also with the support of third-party companies, continuing to provide transparent information to the competent institutions. 12. " The results of the tests by the Zurich laboratory on the remains of the Morandi Bridge reveal that the collapse was caused by failure of the wire cables"
"It was written that the analyses from Zurich showed an average 50% corrosion of the cables which made up the wire ropes and that metal cable sheaths were missing in many places along the cables. Based on some objective elements which are documentary in nature, I would like to try and provide some clarification on both of these points. First of all, it must be stressed that the results from Zurich, although provisional and at an intermediate stage (out of a total of 3248 cables, only 2383 have as of yet been observed and classified by resistance class), highlight the full static strength of the Bridge: indeed, if we interpret what is stated on the note from the laboratory in Zurich, with an average corrosion of 50% of the entire resistant section of the wires, there would still be a wide margin of capacity for resistance, such that it could not have caused them to break. There also would have been progressive phenomena of deformation present which would be visible over time to any motorway user. This fact was also confirmed by independent reconstructions by authoritative experts, who have spoken out in the last few days in an academic capacity. As for the lack of sheaths on the cables, a 2016 monitoring report by Spea, carried out by coring on the wire ropes of Piles 9 and 10, showed the presence of the sheaths in all the diagnostic tests performed. The remains of Pile 9 taken apart after the collapse showed that the sheathing was also present in the primary cables (except, as per the construction project, in the area corresponding to the antenna). It has therefore been proven that the sheaths were there and properly fulfilling their function of containing the cement matrix wrapping the individual strands. Whilst we await the completion of the tests, I would like to emphasise that the results which have emerged thus far from the analyses in Zurich seem to confirm that the failure of the wire ropes was not the primary cause of the collapse of the Bridge, as I have stated repeatedly." 13. "Aspi legal counsel files a charge against journalists who reported on the legal proceedings relating to the investigation on the collapse of the Morandi Bridge"
FACTS: In relation to the news published by a number of media on 21.12.18 in relation to the petition filed on 11.12.18 with the Genoa Public Prosecutor by the legal counsel for the executives and managers of Autostrade per l'Italia who are subject of investigations in the enquiry on the collapse of a section of the Polcevera viaduct, the legal counsel clarify that the request does not contain any charge against journalists who reported on the judicial proceedings related to the investigation on the collapse of Morandi Bridge, considering freedom of press to be a fundamental pillar of our democracy. The aim of the initiative is instead simply to receive confirmation from the Public Prosecutor of the veracity of the quotes of the interrogators of the suspects themselves which appeared in the press. This is for the purpose of protecting the rights of the suspects themselves. Any other interpretation is misleading and does not represent the intentions of the defence lawyers for those who filed the petition. 14. "Autostrade per l'italia: territorial offices confirm safety of the viaducts"
With reference to the 5 viaducts, of a total 1943 managed by Autostrade per l'Italia, which were considered "at risk" according to press reports, the company's competent Territorial offices reiterate that there is no risk to safety. On 4 December 2018, the company sent the Ministry of Infrastructures and Transport a report on the viaducts in question – Gargassa, Pecetti (A26), Moro (A14), Paolillo (A16), Sarno (A30) – containing details of the maintenance interventions completed or ongoing, in addition to the inspections carried out. In no case was any problem encountered regarding the safety of these works, which were also subject to inspection by the Ministry's competent inspection offices. As regards the viaduct Sei Luci, Genoa's territorial office confirms that it has carried out a four-day (23-27 December 2018) local restoration intervention on the bar cover concrete, which had no effect on the static profile. This intervention was also formally communicated to all competent authorities. Therefore, any information that considers these viaducts to be at risk is unfounded. 15. "The theory that the collapse of the Morandi Bridge was due to a steel coil falling from the trailer of an HGV was suggested by Autostrade per l'Italia"
FACTS: In relation to the indiscretions published in the press on 18/02/19, Autostrade per l'Italia recalls that the cause of the collapse - as a consequence of a steel coil falling from the trailer of a HGV - was publicly proposed not by the company, but by individuals outside the company, including academia, presumably in consideration of the particular position of the coil on the ground. In terms of the indiscretions in the testimony given by the Czech Sped.it driver, it should be remembered that the vehicle he drove was found on the ground at least 160 metres away from the HGV transporting the coil, and that between the two lorries were several other vehicles, including heavy goods vehicles, in conditions of minimum visibility due to intense rainfall. Autostrade per l'Italia will officially submit a theory for the collapse to the competent authorities as soon as its consultants have finished analysing the available information in order to reconstruct the possible causes, duly supported by numeric and structural analyses. 16. "Autostrade carried out in-house maintenance operations and inspections in order to circumvent controls "
FACTS: With regard to the article "Manutenzioni e ispezioni affidate in casa, ASPI aggirava tutti i controlli" (ASPI used to circumvent all controls by carrying out in-house maintenance operations and inspections), published on 7th April 2019, it is important to clarify that, according to the law, control activities are to be carried out by the authority, which can avail itself of either the employees who usually perform such tasks within the framework of their specific professional responsibilities or any subsidiary, associated or third-party company meeting the same prerogatives. Ever since the ‘80s, Autostrade per l'Italia has been entrusting the control activities on its own network to the SPEA subsidiary, which managed both the designing and the building of many portions of the very network. Moreover, it is worth noting that the article establishes an arbitrary link between two elements – namely the 2018 ANAC report on the entrusting of "works" and the monitoring "services" that Autostrade per l'Italia entrusted to SPEA – which are in no way linked to each other. Indeed, in the observations made with regard to outsourcing obligations, ANAC only makes reference to the entrusting of "works", since ASPI, which is not a contracting authority, was only required to outsource 60% of "works" by use of a public tender until 18th April 2018, pursuant to the previous Italian Public Procurement Code. On the other hand, the new Code, which entered into force only on 19th April 2018, envisages the obligation to include services, supplies and works (for a total of 60%) in public tenders. These are objective, verifiable facts that are in no way subject to different interpretations. Therefore, what the article did by establishing a link between ANAC's observations on the entrusting of "works" and the monitoring "services" entrusted to SPEA is wrong and misleading. Moreover, the practice of entrusting engineering services to a subsidiary or an associated company, which is envisaged in the Community legislation, is followed by both European companies and the most important Italian contracting authorities. Therefore, the company's conduct is in full compliance with European and Italian procurement laws.